This innovative study explores selected odes and epistles by the late-first-century poet Horace in light of modern anthropological and literary theory. Phebe Lowell Bowditch looks in particular at how the relationship between Horace and his patron Maecenas is reflected in these poems' themes and rhetorical figures. Using anthropological studies on gift exchange, she uncovers an implicit economic dynamic in these poems and skillfully challenges standard views on literary patronage in this period. Horace and the Gift Economy of Patronage provides a striking new understanding of Horace's poems and the Roman system of patronage, and also demonstrates the relevance of New Historicist and Marxist critical paradigms for Roman studies. In addition to incorporating anthropological and sociological perspectives, Bowditch's theoretical approach makes use of concepts drawn from linguistics, deconstruction, and the work of Michel Foucault. She weaves together these ideas in an original approach to Horace's use of golden age imagery, his language concerning public gifts or munera, his metaphors of sacrifice, and the rhetoric of class and status found in these poems. 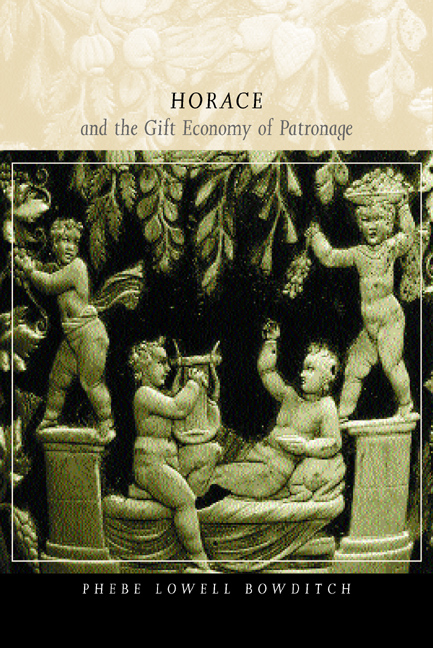 Horace and the Gift Economy of Patronage represents an original approach to central issues and questions in the study of Latin literature, and sheds new light on our understanding of Roman society in general. Phebe Lowell Bowditch is Associate Professor of Classics at the University of Oregon.